Diesel isn't afraid to let its fans do the talking, and the influencing, with its Be Stupid campaign. The t’interweb has changed the way we engage with brands and the things we buy by integrating our friends and networks into the decision process. I realise this isn’t anything new, heck I’ve even written about it before. But it’s worth a revisit this week. The reason being that Gartner have released a report to quantify exactly how they think this process is taking place. Drawing parallels with Edelman’s own thinking on the topology of influence, the report explains that 74% of people can be categorised as connectors, mavens or salesmen when it comes to recommending things to friends. Whatever lexis we use to group people, the fact remains that now, more than ever, our group of friends are the advocates we listen to and trust to the highest level. This is obviously facilitated perfectly by the online world – explained here very well by Paul Adams of Google – leading Gartner to quite rightly/obviously claim that companies need to engage with people on social networks. I’d hope to be preaching to the converted in flagging that fact, but Gartner believe this is ‘a critical but underutilised aspect of the marketing process’. Critical it definitely is, earlier in the year, we here at Edelman conducted a study which looked at social entertainment (the annual Edelman Trust in Entertainment survey). The research from across the UK and US showed how for the first time social networks have emerged as a source of entertainment in their own right. With more than 70% of 18-34 year olds putting social networks alongside the likes of TV and film as a tool to keep them entertained, the window of opportunity for purchase recommendations is greater than ever. 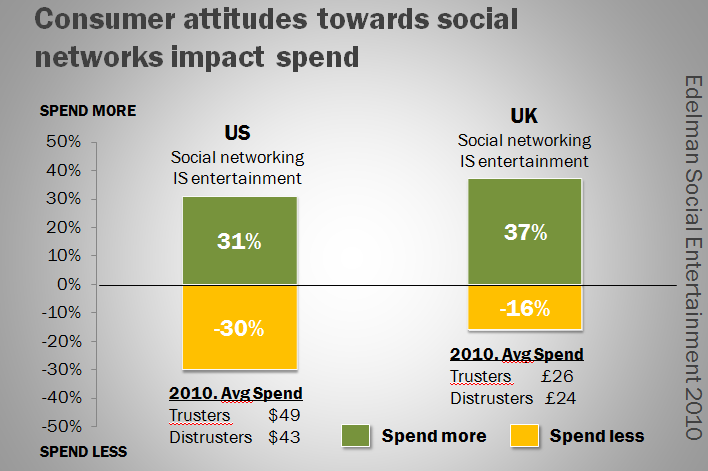 However, anyone who has the keys to a marketing budget will quite rightly want this ‘influence’ converted into some kind of ROI which makes the following stat from the research pretty interesting – 37% of those who view social networks as an entertainment source, spent more on entertainment this year than last year. If any brands need further convincing of the importance of influence and engagement over reach, they should take a look at these results from the World Cup which sort of say it all. Click here for more information on Edelman’s annual ‘Trust in Entertainment’ survey. Three Lions On My Phone, Jules Remy Still Streaming? Here’s a thought, could this year’s Football World Cup in South Africa be the digital straw that finally breaks the 3G networks back(bone)? Consider the TV viewing habits of most English blokes (and may ladies as well) come June. For one month of the year, national teams that have previously held no interest whatsoever to an individual will become must-see matches. 17th June Greece versus Nigeria, must see match, 19th June Cameroon versus Denmark, must see match. The World Cup, like perhaps no other sporting tournament on the planet, turns billions of people into sport junkies from the first group game to the final. And this year, football aficionados will be able to watch the games officially – and unofficially – over 3G and wireless networks. Anyone living in London with an iPhone under an 02 contract is already experiencing daily connectivity issues as the network struggles to cope. The somewhat embarrassing admission by Ronan Dunne, head of 02, over the poor coverage being down to unexpected demand for data services (for a phone that is sold on its Internet capabilities? Go figure that one out) is not only somewhat of an own goal but also perhaps a precursor for things to come. Don’t worry, I can hear you say, Wi-Fi will help take demand off the 3G network. Well yes it will, until pubs and clubs get smart about people putting a massive load on their networks. I don’t know about other iPhone owners but even with a full Wi-Fi signal I struggle to get the subscription Sky Sports service to run on Virgin Trains or BT Hotspots, probably because the network is discriminating against these types of services. And with the likes of www.tvcatchup.com which can stream live TV from a multitude of free-to-air stations in the UK over a 3G network (and Wi-Fi as well), it’s not hard to see how networks could soon become swamped. After all, while the preference will always be to switch to a Wi-Fi connection, there will still be plenty of iPhone and other smartphone owners – in parks walking their dog, doing the shopping with their partner, at the zoo with their kids – who’ll have one eye on the monkeys and the other eye on how the three lions are getting on against the USA. My bet is that come 11th June when the hosts South Africa kick off against Mexico in the inaugural game of the 2010 competition, data networks will start to creak. When England take the field a day later against the yanks, they could come to a standstill.